The Chapter starts with Ozen giving instructions to both Riko and Reg, they will remain in that place for the next 10 days, if they survive then… They will have what it takes to keep going forward…Or down…or whatever, whatever the case they have to protect each other. Soon enough Our Heroes start exploring, the priority now it is to try to find fresh water, Riko then detects a pink glow not too far, she pressures herself with Reg behind her. They find a pool of water, bathed in pink light, various insects where there. Reg wonders if such water is truly clean; Riko says that it is since that kind of insects only predates on clean water, so it is perfectly edible! Riko takes her helmet and puts it on the water in order to obtain some of it. Suddenly all those insects starts sprading, a shadow starts obstructing the pink light, a giant Hipopotamus like creature has appeared and attacked Riko! Still she was able to survive; but now they know of the dangers of the Abyss and that everything in this place can eat you. Later Our Heroes starts a fire, Riko says that since the creatures here are used to the darkness then some light will prevent them from coming since it would hurt their sight. Good idea!... Although a swarm of insects attracted by the fire came so they have to get some insects repellent. Meanwhile Ozen´s guards and Ozen herself are checking the kids at the distance, one of them , the elder one, says that Riko is very brave although her body is weak and can´t do what her minds demands it to do. On the other hand, Reg has a strong and sturdy body (He says that while he sees how Reg is brutally attacked by the Hippopotamus); but he is very indecisive, and even a little coward…So yeah they must be together. Our Heroes start making a plan in order to tackle that Hipopotamus thing! After burning some female Hippo´s poop the creature comes closer and closer to where Riko is! She avoids the tackle of the creature and calls Reg to action! Reg, who was hiding behind some wood, extend his arms and catches the creature! Now It is time to cut it and cook , and eat it and everything! Ozen starts remembering her time with Lyza, their adventures and even when Lyza presented Torka, AKA her Husband…There was some disappointment on Ozen´s eyes; but still they have to keep going further. Back in the present Riko and Reg are eating some meat from the Hippo, this must take care of the food for the rest of the days. Ten days passed and Marulk was able to see them through the Spyglass so she quickly put down the gondola and cheerfully received them. Riko straight up goes to rest while Reg and Marulk starts chatting about various topics, until she decides to make them something to eat; Marulk returns quickly and she says that her Master wants to celebrate their returning so all of them will be eating together! Riko gets up after hearing such news. Ozen starts saying about the different White Whistles; but she makes a especial mention of one… The one known as “The Sovereign of Dawn” Bondrewd the Novel… They must avoid him at all cost. Also Ozen has come to respect their abilities and says that the time in the abyss can be tricky, since she remembers one time when she though she spent just a few weeks when in truth it was months…SO who knows? Maybe is Lyza all young and fresh waiting for her? Riko tries to happily hug her; but she meet the furious finger of Ozen. After that both Youngsters started hearing everything Ozen had to tell them about the abyss, it´s creatures and other dangers and knowledge that only a White Whistle could have. 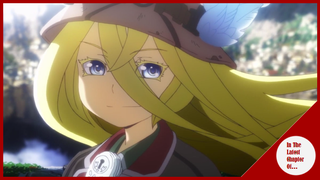 When they finally came out of the abyss, Lyza, now better, starts saying that the moment they went out Riko started walking towards the abyss… Something Creepy, still… She loves her daughter and wants the best of her, she even has though in leaving all this Raiding business behind and just focus on raising her… So she wants to go a last time towards the abyss. Also she wants that in order to Riko to be free since she knows that if she stayed she would never be able to let her go. Loved everything about this chapter! While the action was too little, the understanding about the character of Ozen in both with Lyza and our young heroes was enough for me to be satisfied by it. At the same time the last scene when Riko and Reg says their good byes to Marulk and the others it was very well done, and while the feelings of departure didn´t came to me I was able to understand why Marulk would be sad to see them go since for them, no matter if they come back, or if they keep going down…This is their last good bye and one to the only kids of her age she has ever known. What it truly made the impact was more showing of the relation of Lyza and Ozen, especially when the tragedy for Riko´s Mom came… Since she was depressed, she lost her hubby and her baby was born dead, still… The miracle happened and thanks to the artifact Riko came to life which brought back the light on her eyes, a reason to keep going. Plus we saw a little of Leader when he was young. SO that was pretty neat,. Another good point was the other way Ozen treats the people, especially Riko and Reg who by the end were more or less comfortable with her. SO all in all a very good chapter.